We like Star Trek: Discovery, we really do. At the same time, we wonder, “Why do studios insist the only way to do Star Trek today is to modernise it into a gritty action drama?” Does it have to be so? Is Roddenberry’s utopian vision of the future somehow outdated? Though CBS Paramount seem terrified of anything “too Trekky”, others have not been timid. Sensing the wide-open void for something styled in the old spirit of Trek, Seth MacFarlane (of all people) made his move with The Orville. Before you scoff, let’s not forget that MacFarlane clearly knows his Star Trek. 1) Patrick Stewart regularly appears on his shows. 2) He reunited the entire Next Generation cast for the first time on an episode of Family Guy. 3) He cast Michael Dorn in Ted 2 and dressed him up as Worf. 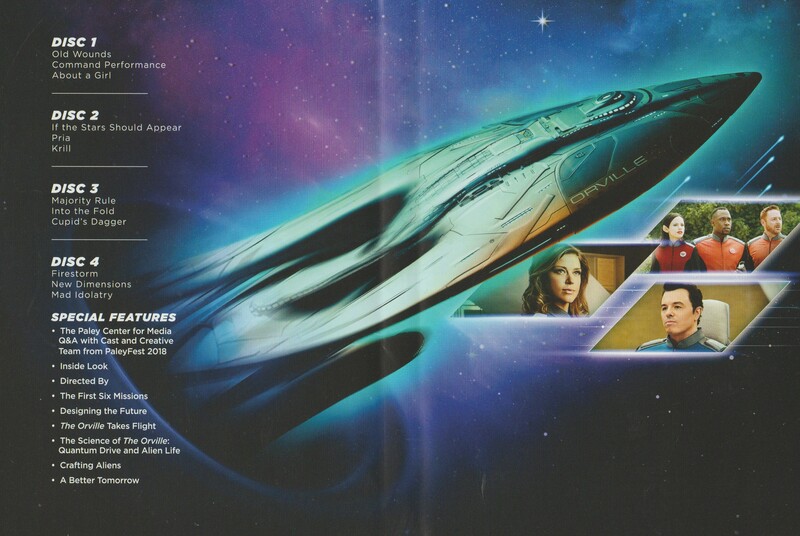 It should surprise no one that The Orville is closest in spirit to Star Trek: The Next Generation. In fact, not even Deep Space Nine or Voyager are this close. From the gentle pastel sets including conference rooms, hallways and holodecks, to the techno-babble, to the minimal use of violence, The Orville is the NEXT Next Generation. It is the Enterprise D, but if Captain Picard allowed the crew to crack wise when opportunity knocked. It would take only the slightest nudge to turn The Orville into Trek canon. Change some names and terminology, tone down the humour slightly, and you’re there. Humour on a starship? Yes, of course, but The Orville is not a comedy. It is first and foremost science fiction, and indeed some of the best science fiction on television since Star Trek: Enterprise was cancelled. The episodes are generally commentary on modern society, much like Star Trek has always been. Change the setting to outer space and suddenly it’s parable. Topics covered include the “court of public opinion” seen in social media today, gender reassignment, underachievers, religion in society, and making the most difficult decisions. The biggest difference between the voyages of the Orville and the Enterprise isn’t even that big: on the Orville, there are no transporter beams. The crew of The Orville is obsessed with Earth culture circa 1980-present, but that is to be expected given Seth MacFarlane’s own interests. References to movies and TV shows of today are rampant. Jokes are toned down from the usual modern fare, but the pilot episode sets up a comedic premise. Captain Ed Mercer (MacFarlane) catches his wife, Commander Kelly Grayson, in bed with a blue alien (Rob Lowe). When Grayson is assigned as his first officer on the Union ship the Orville, the entire crew learns of their marriage issues. Captain Mercer’s best friend (and best pilot in the fleet) is Lt. Gordon Malloy played by Scott Grimes of American Dad. 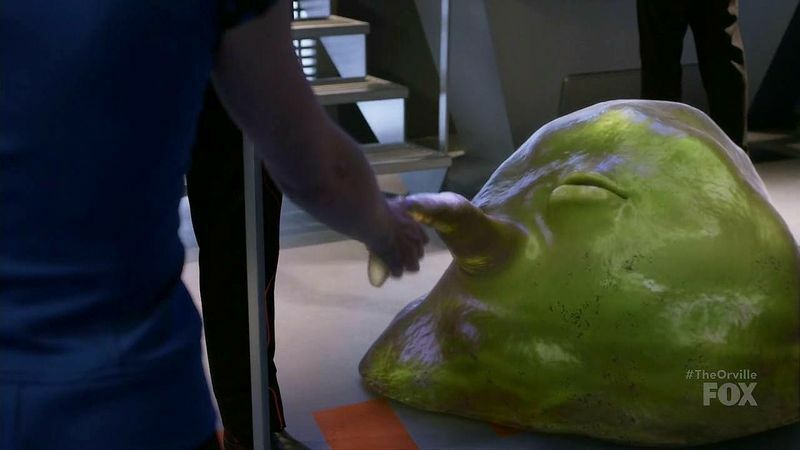 Seth’s buddy Norm MacDonald also shows up as Lt. Yaphit, a gelatinous yellow blob based on Odo from Deep Space Nine, but played for comedy relief. Too much science fiction today has flimsy barely-there characters. The Orville’s crew are more fully formed than the usual, with a few receiving interesting story arcs. They are all new versions of classic archetypes. The robot Isaac (Mark Jackson) is the twist on Data. He is still immensely curious about humans, but knows he is vastly superior and considers everyone on the Orville his inferior. Bortus (Peter Macon) is your “Worf”, a deep voiced, strong alien species with head ridges. His unique trait is that his race is single-gendered, and much of his character development is in tandem with his partner Klyden (Chad L. Coleman). Halston Sage plays the inexperienced security chief Alara Kitan, a young alien from a planet with such high gravity, that their species have evolved tremendous physical strength. Though small she can easily throw a punch to send Bortus flying, or re-shape a cube of titanium with her hands! Yet she lacks the confidence that her crewmates have in her. More casting genius: Penny Johnson Jerald, Deep Space Nine‘s Kassidy Yates, as ship’s doctor Claire Finn. In cameos or recurring roles are Ron Canada (Next Generation), Charlize Theron and Liam Neeson (A Million Ways to Die in the West), Victor Garber (Titanic), Mike Henry (Family Guy), Robert Picardo (Voyager‘s Doctor), and Jeffrey Tambor (Arrested Development). One has to respect both the sheer talent involved, and the willingness of Star Trek actors to participate. As the show grows during its first season, comedy takes a back seat to science fiction. In the bonus features, MacFarlane states that he paid attention to fan feedback, and he noted that fans were discussing the legitimate characters and science fiction tales. Episodes feature a new twist on classic sci-fi (and even Star Trek) themes: living in a simulation, a space zoo, Flatland, a civilisation living in a generation ship without its own knowledge, interference with space-time and developing cultures, and many planets with Earth-like societies that act as a mirror for us to view our own. Ray guns are rarely used, and monsters are usually misunderstood. It’s remarkable but not untrue to say that The Orville is Star Trek, but without infringing any copyrights. Dig a little further in the credits and you’ll have a better understanding of how they managed to play The Orville so close to classic Trek. In the director’s chair: Jonathan Frakes, AKA Riker, and director of Trek on both TV and in cinemas. Also directing: Robert Duncan McNeill, AKA Tom Paris and also director of many Voyager episodes. Behind the scenes is Brannon Braga, a producer on The Next Generation, Voyager, Enterprise, Cosmos…and The Orville. Jon Favreau even directed the pilot episode. With a team like this in place, MacFarlane and friends were more than capable of making a show truly within the optimistic Roddenberry philosophy. Guys like Braga, Frakes and McNeill spent years living in that universe. The DVD includes your traditional special features, the best of which is a Q&A session with the cast and creators of the show. Another interesting featurette is about the physical model of the Orville spaceship, used for those slow “beauty shots”. The Orville is the show that Trek fans have wanted for years now, at least since JJ Abrams brought it back to movie screens. The true Trek on TV is not Discovery. It’s not Short Treks. It is The Orville. If that pisses off CBS Paramount, then too bad. If they won’t make the Trek that fans want, then someone else will — and did. I have to admit, I haven’t watched this, but I have been thoroughly intrigued by it. This might push me to give it a try. Great review. Thank you. The hype is legit. This show would have been mentioned in my lists last year, had I seen it in time! Everybody seems to be going on about how great his show is, I’ll have to watch it for myself. The hype is for good reason. I think in particular you would like the religion episode (season finale). The set up is this planet bases a religion off an Orville crew member, and they get to see the planet evolve into basically what we have today. A mess! Welcome aboard The Orville! I’ve heard that MacFarlane had been hounding Paramount for years to allow him to do something in the Trek Universe, but they couldn’t bring themselves to hand the keys over to the “cartoon guy”. Good job, Paramount! Like I said — if they are pissed about it, too bad. They could have done this. I don’t think they could have done it better though. Seth had nothing to lose. Oh yeah, and I think they are now with that new cartoon from the Rick and Morty guy. They’re not afraid of “cartoon guys” anymore. I did not know this existed, but now I gotta see it! Highly recommended! I’m all caught up on the second season. Big new recurring cast member — Jason Alexander as the bartender. So the real question is, as bartender, does he finally have hand? I have to admit I don’t get what you mean. I’m not the Seinfeld maniac that my sister is! I like Jason Alexander though, he’s been on lots of shows I like (including American Dad). Haha I’m no Seinfeld expert either – I’ve only ever seen one whole episode! But I do remember people talking about an episode where they have no hand, like upper hand or whatever. Try this! Haha thanks! I can say he has two hands though, and a roughly dinosaur looking head. This show has more full head gear rather than just facial bumps for aliens. 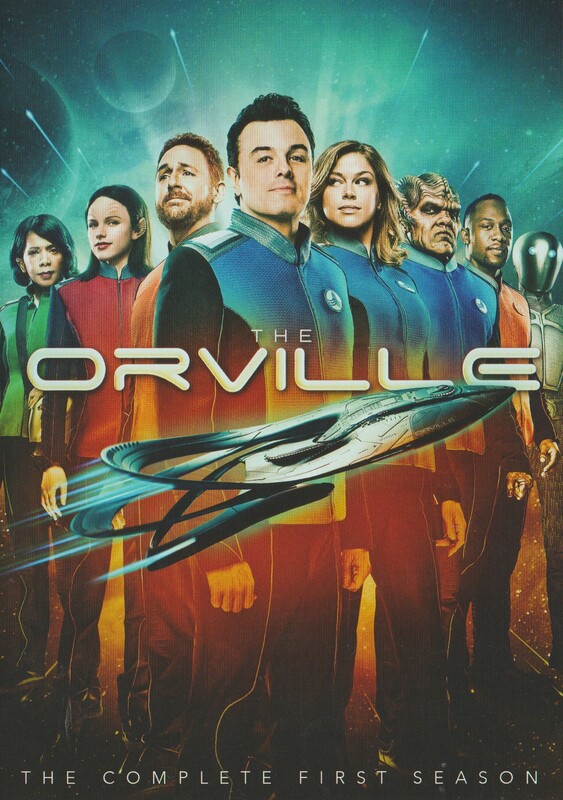 I LOVE the Orville! I keep thinking, “Please don’t cancel, please don’t cancel…” It’s too good!